"…a man of rare natural gifts, he raised himself to a high position among the journalists of Ireland. He was a brilliant and graceful writer, a true humourist and an accomplished poet. Robin was a kind friend, a genial companion and a true son of County Down." 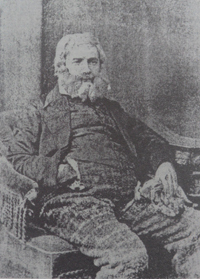 An accountant, a teacher of shorthand, an elocutionist and, in later years, a newspaper editor, Wesley Greenhill Lyttle was above all an entertainer, often in the guise of his alter-ego "Robin", a jovial country farmer who regaled his audiences in Ulster-Scots.1 Lyttle had been a lecturer in Dr Corry’s Irish Diorama company which toured Britain and America with a show entitled `Ireland, its scenery, music and antiquities’. The show featured large limelight views of Irish beauty spots, illustrated in prose, verse and song. For most of the 1870s Lyttle lived in Belfast where he began to write and perform his humorous monologues. However, he took a change of direction in 1880 when he established the North Down Herald in Newtownards. In his first editorial he claimed that the paper would be independent, " `devoid of party politics, of an aggressive nature, we shall know no man.’ He proceeded to quote from Gilbert & Sullivan’s 1878 triumph HMS Pinafore; Sir Joseph Porter always `voted at his party’s call, and never thought of thinking for himself at all.’ There are no Sir Joseph Porters on the staff of the North Down Herald." Lyttle moved the newspaper to Bangor in 1883 and had it assume the additional title of The Bangor Gazette. As editor, he allowed his imagination to enhance his reports. On occasion the usual matter-of-fact style would give way to humorous accounts of cases from the local magistrates’ court. Even totally fictitious happenings could appear, much to the amusement of his friends and consternation of his enemies. A collection of these articles would still be of interest if published today. Lyttle published his humorous monologues as Robin’s Readings and continued to give public performances. He staged the first Burns’ Night entertainment in Bangor in 1895 with limelight views of Scotland and novelty views of Bangor [Belfast News-Letter, 26th January, 1895]. Undoubtedly, Lyttle’s fame today rests largely on his novel Betsy Gray. It first appeared in serial form in the Herald, beginning on Saturday 7th November 1885. Another of Lyttle’s serials, Daft Eddie or the Smugglers of Strangford Lough appeared in 1889. Serials were popular attractions in Victorian newspapers and periodicals. Charles Dickens first published his novels in this form. However, a fellow novelist, Mrs Margaret Oliphant, expressed her anxiety over `the violent stimulant of weekly publication with its necessity for frequent and vapid recurrence of piquant incident and startling situation.’ In short, the author would include a number of `cliff hangers’ to ensure the reader would buy the next issue. Betsy Gray or, Hearts of Down appeared in paperback in 1888; a third edition came in 1894 and an illustrated sixth edition was published in 1913 by Robert Carswell, revised by the Belfast antiquarian Francis Joseph Bigger [Irish Book Lover, Volume IV, February 1913, page 128]. Lyttle’s account of 1798 is not primarily historical, but is rather a melodrama in serial form.2 Betsy Gray was meant to be read by the fireside after a day’s work, or aloud to friends and family through the winter of 1885/6 and, if we assume one chapter was printed in each week’s issue of the Herald, it would have continued until the end of August 1886. Nevertheless, because Lyttle has recorded the traditions from 1798 told at the Six-Road-Ends and Greyabbey areas, his work contains fragments of history not written down elsewhere. 1. His name is usually given as Wesley Guard Lyttle, an error first committed in the obituary published in the Belfast News-Letter, Monday 2nd November, 1896. However, the probate of Lyttle’s will and published legal notices name him as Wesley Greenhill Lyttle. The error possibly arose from a confusion with the prominent Methodist of the day, Rev. Wesley Guard. 2. For a survey of the sources Lyttle used when writing Betsy Gray, see K. Robinson Betsy Gray Revisited in The Journal of the Upper Ards Historical Society 24 (2000), pages 8-13.